With her permission, I am posting some good news communicated by Georgia Conti, founder of the Patzcuaro Birding Club. Hugo Valencia, of our Lake Patzcuaro area, has received a scholarship for advanced training at the prestigious Long Point Bird Observatory in Ontario, Canada. I have birded when Hugo was assisting birders. He has a keen eye and ear, and is very helpful and nice. Hugo and Georgia assist birders at La Estación, a good site near Erongaricuaro. Hugo with his youngest daughter. Many of you know that I have been working this past year with Victor "Hugo" Valencia, a local birder from Erongaricuaro. He is an exceptional birder and I couldn't have a better partner in the field. We recently received news that he has been selected one of three individuals from Latin America to receive free training from the Long Point Bird Observatory in Ontario. His program begins mid-August and ends early November. While in Ontario, he will receive advanced training in bird banding and data management techniques and other field techniques related to bird research and conservation. Since Mexico is recognized as being an important wintering area for Canadian songbirds in Latin America, this training has practical benefits to Canadian researchers and conservationists. This program is also supported by the Government of Canada, in particular Environment Canada's Canadian Wildlife Service. Both Hugo and I hope his training will enhance the field work being done by Dra. Laura and Dr. Fernando Villasenor Gomez at the Universidad de Michoacan in Morelia. While all of his air travel costs, course training, and all living expenses in Canada are covered, he will need financial assistance to support his wife Lupe and two young daughters, Mariana (5 yrs) and Lucia (6 months) in his absence, and to pay for his visa. Moreove, it would be nice to send him north with a little bit of pocket money. so he is not penniless. I am willing to underwrite some of his expenses, but more importantly, Hugo wants to do as much as he can to pay for his training. This note is to ask that if you have any odd jobs on the back burner, he is looking to work full-time between now and the time he leaves. He's a master tile-setter, [can] repair refrigerators and air-conditioners (he can fix most appliances! ), has a green thumb, does interior and exterior painting, and is able to handle most plumbing and electrical work. There is no job big or small that he will turn down. Oh, I almost forgot: he's fluent in English.... And, he knows the difference between mediocre work and that of a master craftsman, not a common talent hereabouts. This is a chance of a life-time for him. Some of you have added life birds to your list or have experienced many rare sightings in the field due to his skills. If you've birded with him, no doubt you will agree that no one sees or hears birds as soon as he can! He's a patient and exceptional teacher as well. If you don't have a job for him but you are willing to donate funds on his behalf, please write to me privately. I have set up an account for deposits on his behalf. Nothing is too little or too big. Let's [congratulate] and support a local birder! hey great blog, and great info, I am visiting morelia soon, just for one day, but I'd like to do some quick early morning birding. Can you recomend a place (ie park or something). Thanks very much in advance. You can visit my blog too! 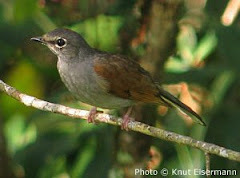 Hola misticeti, You can get best info from our local Birding Pal and best birder, Georgia Conti through http://www.birdingpal.org/Mexico.htm. Your site makes me want to return south again for birding! How can I/we get in touch with you?